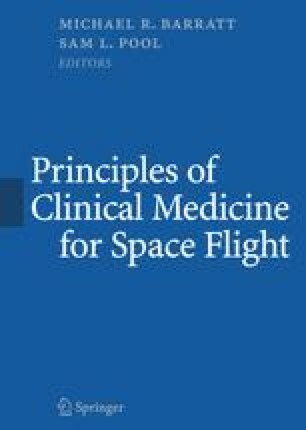 One of the most significant clinical and operational challenges experienced by spaceflight crews during the first few days in microgravity is space motion sickness (SMS) [1–3]. SMS was among the first adverse medical conditions encountered by humans as they ventured outside of Earth’s gravity. Because of SMS, decreased human performance is the main risk during the critical first days of space flight. Activities typically performed early that may be disrupted include payload activation, satellite deployment, rendezvous, and docking. SMS symptoms—particularly malaise, loss of initiative, and nausea—can range from being mildly distracting to physically debilitating. Physiologic systems operate effectively by maintaining homeostasis across a broad range of physiologic functions in Earth’s 1-G environment. Exposure to the microgravity environment of space flight elicits a large collection of physiologic changes and symptoms (including headward fluid shifts, headaches, back pain, and cardiovascular, bone, and muscle changes) that is collectively referred to as space adaptation syndrome. SMS may be considered a component of space adaptation syndrome. Over time, individuals adapt to the weightless environment, and many initial physiologic changes return to normal 1-G values. SMS is not a sickness as such, but it is generally thought to be a natural response to the adaptation of the neurosensory and perceptual systems to microgravity . Individuals who exhibit symptoms of SMS should therefore not be viewed as abnormal. The next four subsections are a review of the signs, symptoms, laboratory findings, epidemiology, and neurophysiology of SMS and EMS. Next, theories of etiology and possible mechanisms involved in motion sickness are briefly discussed. Finally, the last two sections describe the diagnosis and treatment of SMS and EMS.